Dimitar Berbatov scored a hat-trick as Manchester United thrashed 10-man Wigan to move level on points with Premier League leaders Manchester City. Park Ji-sung coolly slotted the hosts into an early lead before Wigan striker Conor Sammon was harshly sent off for catching Michael Carrick in the face. Berbatov fired United 2-0 ahead and netted the third after the break with a neat turn and powerful finish. Antonio Valencia rifled into the corner before Berbatov scored from the spot. Wigan were enraged by referee Phil Dowd's decision to award the penalty for an Antolin Alcaraz challenge on Park which took place just outside the box. But the scoreline did not flatter United, who have now hit 16 goals in four successive league victories to reignite their title challenge. City's 0-0 draw at West Brom means both teams have 45 points, with City's lead on goal difference now cut to only five. 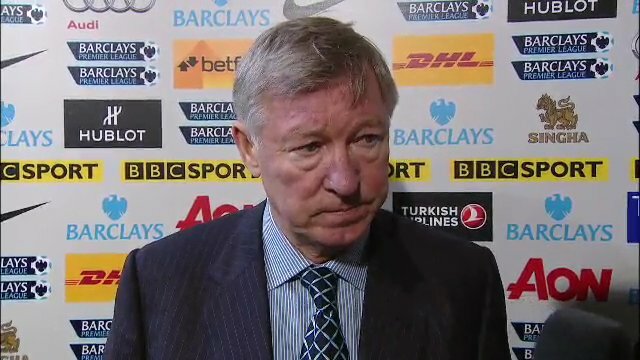 And United's victory was all the more impressive given the makeshift nature of a team depleted by illness and injuries. Michael Carrick and Antonio Valencia lined up in defence, Darron Gibson in midfield and Berbatov was handed a rare opportunity alongside Javier Hernandez up front. For their part, Wigan came into the game off the back of impressive draws with Chelsea and Liverpool but, after conceding an early goal, their chances of getting anything out of the game were effectively ended by the dismissal of Sammon. The striker's flailing arm caught Carrick in the face, but there appeared to be little aggressive intent in the incident. The red card ended any chance of a contest, but in truth United had shown plenty of menace even before Park's early strike. The goal was brilliantly created by Patrice Evra on the left, who skipped past two Wigan players and cut the ball back for Park to side-foot precisely into the net. It was 15 minutes before Wigan enjoyed any sort of sustained possession, but when they did it prompted a great chance for Sammon. Ronnie Stam's cross from the right was inviting for the lone striker but he inexplicably failed to get any sort of header on the ball. United were soon back on the offensive with a Nani cross sparking mayhem in the Wigan box and Gibson, Ryan Giggs and Berbatov trying their luck from long range. Stam remained Wigan's brightest spark, getting in behind Evra on the right and delivering a succession of crosses which Wigan's forwards were unable to make the most of. The momentum swung back United's way as Sammon's controversial red card was swiftly followed by Berbatov's second goal in as many games. A Gibson cross was flicked on by Hernandez to the Bulgarian, who held off Alcaraz and lashed home with his left foot. United almost extended their advantage at the start of the second half, but Park's free header was directed straight at Wigan keeper Ali Al Habsi. Hernandez then had a penalty appeal turned down despite being wrestled to the ground by Maynor Figueroa. United's sense of grievance was short-lived as Berbatov collected a pass from Valencia and fired past Al Habsi. Valencia then made it 4-0 with a rasping drive across Al Habsi after a corner was cleared straight to Carrick. Then came the penalty incident which presented Berbatov with the chance for his hat-trick, an invitation the Bulgarian gratefully accepted by passing the ball into the corner of the net. Wigan never gave up but could not create a clear opportunity as United keeper Anders Lindegaard maintained his 100% Premier League clean sheet record. 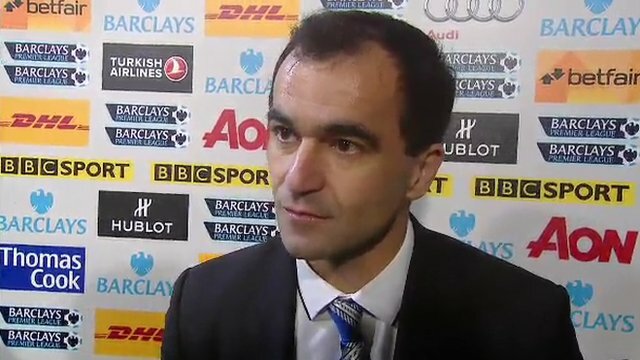 Wigan boss Roberto Martinez: "The red card is a shocking decision. There was a little bit of a fight, as there was every time the two players went for the ball. None of them should have been a red card. None of them were malicious. There was no intent. "If you want to show a red card using those standards, do it, then you will end up with six men each. "Anyone who has been on a football pitch knows that incident was a normal action. "I was surprised when he gave the free-kick. To see the red card, I was gobsmacked." 90:00+2:24 The referee signals the end of the game. 90:00+1:40 Cross by Ronnie Stam (Wigan), save (caught) by Anders Lindegaard (Man Utd). 90:00+0:51 Goal kick taken long by Anders Lindegaard (Man Utd). 90:00+0:44 Shot by Antolin Alcaraz (Wigan) right-footed from right channel (30 yards), missed right. 88:58 Shot by Darron Gibson (Man Utd) drilled right-footed from right channel (25 yards), save (parried) by Ali Al Habsi (Wigan). 87:24 Goal kick taken long by Anders Lindegaard (Man Utd). 87:03 Shot by Maynor Figueroa (Wigan) left-footed from left side of penalty area (18 yards), missed left. 85:32 Foul by Antolin Alcaraz (Wigan) on Federico Macheda (Man Utd). Free kick crossed right-footed by Wayne Rooney (Man Utd) from left wing, clearance by Antolin Alcaraz (Wigan). 85:13 Attacking throw-in by Ezekiel Fryers (Man Utd). 83:25 Foul by Wayne Rooney (Man Utd) on James McArthur (Wigan). Free kick taken right-footed by Ronnie Stam (Wigan) from own half, passed. 83:05 Defending throw-in by Antolin Alcaraz (Wigan). 82:42 Defending throw-in by Antolin Alcaraz (Wigan). 82:35 Cross by Antonio Valencia (Man Utd), resulting in ball out of play. 82:06 Cross by Antonio Valencia (Man Utd), clearance by Antolin Alcaraz (Wigan). 79:39 Free kick taken right-footed by James McCarthy (Wigan) from right channel, passed. 79:39 Substitution Wigan substitution: Victor Moses replaced by Hugo Rodallega (tactical). 79:34 Foul by Wayne Rooney (Man Utd) on Franco Di Santo (Wigan). 79:04 Cross by Federico Macheda (Man Utd), save (caught) by Ali Al Habsi (Wigan). 77:49 Assist by Ji-Sung Park (Man Utd) from left side of penalty area. 77:49 GOAL - Dimitar Berbatov:Man Utd 5 - 0 Wigan Placed penalty taken right-footed by Dimitar Berbatov (Man Utd) (bottom-right of goal), scored.Man Utd 5-0 Wigan. 76:56 Foul by Antolin Alcaraz (Wigan) on Ji-Sung Park (Man Utd). 76:21 Attacking throw-in by Ezekiel Fryers (Man Utd). 74:49 Assist (pass) by Michael Carrick (Man Utd) from right channel. 74:49 GOAL - Antonio Valencia:Man Utd 4 - 0 Wigan Goal by Antonio Valencia (Man Utd) drilled right-footed (bottom-left of goal) from right side of penalty area (18 yards).Man Utd 4-0 Wigan. 74:28 Outswinging corner from right by-line taken right-footed by Wayne Rooney (Man Utd) to centre, clearance by Antolin Alcaraz (Wigan). 74:18 Cross by Antonio Valencia (Man Utd), blocked by James McCarthy (Wigan). 73:56 Corner from right by-line taken short right-footed by Wayne Rooney (Man Utd). 73:51 Cross by Wayne Rooney (Man Utd), clearance by James McArthur (Wigan). 73:20 Inswinging corner from left by-line taken right-footed by Wayne Rooney (Man Utd) to near post, clearance by James McCarthy (Wigan). 73:13 Cross by Federico Macheda (Man Utd), save (tipped over) by Ali Al Habsi (Wigan). 71:47 Defending throw-in by Ezekiel Fryers (Man Utd). 71:03 Goal kick taken short by Ali Al Habsi (Wigan). 70:31 Substitution Wigan substitution: Jordi Gomez replaced by James McArthur (tactical). 70:21 Shot by Wayne Rooney (Man Utd) right-footed from left channel (25 yards), missed left. 69:54 Cross by Antolin Alcaraz (Wigan), save (caught) by Anders Lindegaard (Man Utd). 69:33 Cross by Wayne Rooney (Man Utd), clearance by Antolin Alcaraz (Wigan). 68:54 Handball by Wayne Rooney (Man Utd). Free kick taken left-footed by Jordi Gomez (Wigan) from own half, passed. 67:43 Shot by Javier Hernandez (Man Utd) left-footed from left side of six-yard box (6 yards), save (blocked) by Ali Al Habsi (Wigan). 67:38 Shot by Wayne Rooney (Man Utd) volleyed right-footed from right channel (20 yards), blocked by Javier Hernandez (Man Utd). 67:35 Cross by Ezekiel Fryers (Man Utd), resulting in open play. 67:03 Corner from right by-line taken short right-footed by Antonio Valencia (Man Utd). Cross by Antonio Valencia (Man Utd), resulting in open play. 66:53 Cross by Ji-Sung Park (Man Utd), blocked by Jordi Gomez (Wigan). 65:08 Shot by Franco Di Santo (Wigan) left-footed from centre of penalty area (12 yards), save (with feet) by Anders Lindegaard (Man Utd). 64:08 Cross by Ezekiel Fryers (Man Utd), resulting in open play. Shot by Ji-Sung Park (Man Utd) right-footed from centre of penalty area (18 yards), over the bar. Goal kick taken long by Ali Al Habsi (Wigan). Foul by Federico Macheda (Man Utd) on Ronnie Stam (Wigan). Free kick taken right-footed by Ronnie Stam (Wigan) from own half, passed. 63:48 Attacking throw-in by Jordi Gomez (Wigan). 63:12 Substitution Man Utd substitution: Ryan Giggs replaced by Wayne Rooney (tactical). 63:02 Substitution Man Utd substitution: Luis Nani replaced by Federico Macheda (tactical). 62:11 Foul by Luis Nani (Man Utd) on Maynor Figueroa (Wigan). Free kick taken left-footed by Maynor Figueroa (Wigan) from left wing, passed. 61:18 Foul by Ryan Giggs (Man Utd) on Jordi Gomez (Wigan). Free kick taken right-footed by Gary Caldwell (Wigan) from own half, passed. 61:13 Cross by Ji-Sung Park (Man Utd), clearance by Jordi Gomez (Wigan). 60:56 Cross by Antonio Valencia (Man Utd), clearance by Antolin Alcaraz (Wigan). 57:55 Assist (pass) by Antonio Valencia (Man Utd) from right channel. 57:55 GOAL - Dimitar Berbatov:Man Utd 3 - 0 Wigan Goal by Dimitar Berbatov (Man Utd) right-footed (top-right of goal) from centre of penalty area (12 yards).Man Utd 3-0 Wigan. 55:58 Corner from left by-line taken short right-footed by Franco Di Santo (Wigan). 55:09 Goal kick taken long by Anders Lindegaard (Man Utd). Correction - 53:53 Free kick awarded for an unfair challenge on Victor Moses by Patrice Evra. David Jones has an effort direct from the free kick. 53:53 Foul by Patrice Evra (Man Utd) on Victor Moses (Wigan). Free kick taken left-footed by David Jones (Wigan) from right channel (25 yards), missed right. 53:27 Goal kick taken long by Anders Lindegaard (Man Utd). 52:57 Foul by Patrice Evra (Man Utd) on Victor Moses (Wigan). Free kick taken left-footed by Jordi Gomez (Wigan) from right channel, resulting in open play. 52:15 Goal kick taken long by Ali Al Habsi (Wigan). 51:17 Goal kick taken long by Ali Al Habsi (Wigan). 49:25 Goal kick taken short by Ali Al Habsi (Wigan). 48:43 Outswinging corner from left by-line taken left-footed by Ryan Giggs (Man Utd) to centre, header by Dimitar Berbatov (Man Utd) from centre of penalty area (12 yards), over the bar. 47:46 Goal kick taken long by Ali Al Habsi (Wigan). 47:36 Shot by Darron Gibson (Man Utd) right-footed from right channel (25 yards), missed right. 47:19 Cross by Dimitar Berbatov (Man Utd), resulting in open play. Cross by Luis Nani (Man Utd), resulting in open play. 46:48 Foul by Victor Moses (Wigan) on Michael Carrick (Man Utd). Free kick taken right-footed by Michael Carrick (Man Utd) from own half, resulting in open play. 46:27 Cross by Javier Hernandez (Man Utd), header by Ji-Sung Park (Man Utd) from centre of penalty area (6 yards), save (parried) by Ali Al Habsi (Wigan). 45:56 Cross by Ji-Sung Park (Man Utd), clearance by Gary Caldwell (Wigan). 45:23 Attacking throw-in by Antonio Valencia (Man Utd). 45:17 Cross by Antonio Valencia (Man Utd), blocked by James McCarthy (Wigan). 45:01 Substitution Man Utd substitution: Jonathan Evans replaced by Ezekiel Fryers (tactical). 45:01 Substitution Wigan substitution: Mohamed Diame replaced by Franco Di Santo (tactical). 45:00+1:56 Defending throw-in by David Jones (Wigan). 45:00+1:04 Shot by Mohamed Diame (Wigan) drilled right-footed from left channel (25 yards), save (caught) by Anders Lindegaard (Man Utd). 45:00+0:02 Defending throw-in by Maynor Figueroa (Wigan). 44:17 Floated corner from left by-line taken right-footed by Luis Nani (Man Utd) to centre, resulting in open play. 44:10 Cross by Patrice Evra (Man Utd), blocked by Mohamed Diame (Wigan). 43:23 Defending throw-in by Antonio Valencia (Man Utd). 42:25 Foul by Ryan Giggs (Man Utd) on Jordi Gomez (Wigan). Free kick taken left-footed by Jordi Gomez (Wigan) from left wing, passed. 40:57 Assist (cross) by Darron Gibson (Man Utd) from right wing. 40:57 GOAL - Dimitar Berbatov:Man Utd 2 - 0 Wigan Goal by Dimitar Berbatov (Man Utd) left-footed (bottom-left of goal) from left side of six-yard box (6 yards).Man Utd 2-0 Wigan. 40:42 Attacking throw-in by Michael Carrick (Man Utd). 40:37 Cross by Antonio Valencia (Man Utd), resulting in open play. 40:28 Cross by Patrice Evra (Man Utd), clearance by Maynor Figueroa (Wigan). 40:23 Cross by Antonio Valencia (Man Utd), resulting in open play. 38:43 Free kick taken right-footed by Michael Carrick (Man Utd) from own half, passed. 38:43 Sent off Conor Sammon (Wigan) dismissed for violent conduct. 38:27 Foul by Conor Sammon (Wigan) on Michael Carrick (Man Utd). 38:08 Cross by Patrice Evra (Man Utd), blocked by Antolin Alcaraz (Wigan). 37:36 Handball by Conor Sammon (Wigan). Free kick taken left-footed by Ryan Giggs (Man Utd) from own half, resulting in open play. 36:52 Attacking throw-in by David Jones (Wigan). 36:19 Foul by Jonathan Evans (Man Utd) on Conor Sammon (Wigan). Free kick taken right-footed by Antolin Alcaraz (Wigan) from right channel, passed. 35:56 Goal kick taken long by Ali Al Habsi (Wigan). 35:47 Shot by Darron Gibson (Man Utd) right-footed from right channel (25 yards), missed left. 35:40 Cross by Luis Nani (Man Utd), clearance by Gary Caldwell (Wigan). 35:16 Cross by Ronnie Stam (Wigan), clearance by Luis Nani (Man Utd). 34:13 Goal kick taken long by Ali Al Habsi (Wigan). 33:51 Shot by Dimitar Berbatov (Man Utd) right-footed from right channel (20 yards), missed left. 33:25 Attacking throw-in by Antonio Valencia (Man Utd). 33:16 Attacking throw-in by Antonio Valencia (Man Utd). 32:33 Shot by Conor Sammon (Wigan) right-footed from left channel (18 yards), save (caught) by Anders Lindegaard (Man Utd). 31:33 Foul by Antonio Valencia (Man Utd) on Jordi Gomez (Wigan). Free kick taken right-footed by Ali Al Habsi (Wigan) from own half, resulting in open play. 31:24 Cross by Luis Nani (Man Utd), clearance by Antolin Alcaraz (Wigan). 31:04 Attacking throw-in by Antonio Valencia (Man Utd). 30:57 Goal kick taken short by Anders Lindegaard (Man Utd). 30:27 Cross by Ronnie Stam (Wigan), resulting in open play. 29:17 Shot by Ryan Giggs (Man Utd) left-footed from right channel (20 yards), blocked by Gary Caldwell (Wigan). 28:11 Cross by Ronnie Stam (Wigan), clearance by Jonathan Evans (Man Utd). 27:57 Attacking throw-in by David Jones (Wigan). 27:43 Corner from left by-line taken short right-footed by Victor Moses (Wigan). 27:25 Shot by Victor Moses (Wigan) left-footed from left side of penalty area (12 yards), blocked by Jonathan Evans (Man Utd). 27:04 Goal kick taken long by Ali Al Habsi (Wigan). 25:42 Foul by Maynor Figueroa (Wigan) on Dimitar Berbatov (Man Utd). Free kick taken right-footed by Luis Nani (Man Utd) from right channel (20 yards), missed right. 23:27 Free kick taken left-footed by Jordi Gomez (Wigan) from right channel (20 yards), hit wall. Foul by Mohamed Diame (Wigan) on Javier Hernandez (Man Utd). Free kick taken right-footed by Anders Lindegaard (Man Utd) from own half, resulting in open play. 23:27 Booking Jonathan Evans (Man Utd) booked for unsporting behaviour. 23:18 Foul by Jonathan Evans (Man Utd) on Jordi Gomez (Wigan). 22:38 Cross by Luis Nani (Man Utd), clearance by Antolin Alcaraz (Wigan). 21:25 Free kick taken right-footed by Antonio Valencia (Man Utd) from right wing, resulting in open play. 21:25 Booking David Jones (Wigan) booked for unsporting behaviour. 21:11 Foul by David Jones (Wigan) on Ji-Sung Park (Man Utd). 20:51 Foul by Luis Nani (Man Utd) on Ronnie Stam (Wigan). Free kick taken right-footed by Ronnie Stam (Wigan) from right wing, passed. 19:57 Cross by Darron Gibson (Man Utd), save (caught) by Ali Al Habsi (Wigan). 19:40 Cross by Antonio Valencia (Man Utd), blocked by Jordi Gomez (Wigan). 19:04 Corner from left by-line taken short right-footed by Luis Nani (Man Utd). 18:54 Shot by Darron Gibson (Man Utd) right-footed from right channel (25 yards), blocked by Gary Caldwell (Wigan). 18:29 Cross by Ronnie Stam (Wigan), blocked by Luis Nani (Man Utd). 18:00 Cross by Javier Hernandez (Man Utd), save (caught) by Ali Al Habsi (Wigan). 17:12 Cross by Luis Nani (Man Utd), clearance by Gary Caldwell (Wigan). 16:19 Cross by Michael Carrick (Man Utd), resulting in open play. 15:33 Inswinging corner from left by-line taken right-footed by Luis Nani (Man Utd) to near post, clearance by Mohamed Diame (Wigan). 15:24 Cross by Dimitar Berbatov (Man Utd), clearance by Gary Caldwell (Wigan). 14:33 Attacking throw-in by David Jones (Wigan). 14:00 Defending throw-in by Antonio Valencia (Man Utd). 13:34 Cross by Ronnie Stam (Wigan), resulting in open play. 12:29 Defending throw-in by Antonio Valencia (Man Utd). 11:55 Cross by Antonio Valencia (Man Utd), blocked by Maynor Figueroa (Wigan). 11:24 Cross by Antonio Valencia (Man Utd), clearance by Maynor Figueroa (Wigan). 10:20 Inswinging corner from right by-line taken left-footed by Ryan Giggs (Man Utd) to centre, clearance by David Jones (Wigan). Correction - 10:01 Antonio Valencia produces a cross, Jordi Gomez gets a block in. 10:01 Cross by Antonio Valencia (Man Utd), blocked by Jordi Gomez (Wigan). 9:19 Foul by James McCarthy (Wigan) on Michael Carrick (Man Utd). Free kick taken right-footed by Luis Nani (Man Utd) from right channel, passed. 9:11 Cross by Ryan Giggs (Man Utd), clearance by Maynor Figueroa (Wigan). 8:36 Corner from right by-line taken short left-footed by Ryan Giggs (Man Utd). 8:28 Cross by Ji-Sung Park (Man Utd), blocked by James McCarthy (Wigan). 7:17 Assist (cross) by Patrice Evra (Man Utd) from left side of penalty area. 7:17 GOAL - Ji-Sung Park:Man Utd 1 - 0 Wigan goal by Ji-Sung Park (Man Utd) right-footed (top-right of goal) from centre of penalty area (12 yards).Man Utd 1-0 Wigan. 6:35 Defending throw-in by Patrice Evra (Man Utd). 6:06 Attacking throw-in by David Jones (Wigan). 5:40 Cross by Antonio Valencia (Man Utd), resulting in open play. 4:43 Attacking throw-in by Patrice Evra (Man Utd). 4:20 Shot by Victor Moses (Wigan) right-footed from left side of penalty area (18 yards), blocked by Michael Carrick (Man Utd). 3:37 Foul by Conor Sammon (Wigan) on Luis Nani (Man Utd). Free kick taken right-footed by Michael Carrick (Man Utd) from own half, passed. 2:10 Goal kick taken long by Anders Lindegaard (Man Utd). 0:42 Foul by Antolin Alcaraz (Wigan) on Dimitar Berbatov (Man Utd). Free kick crossed left-footed by Ryan Giggs (Man Utd) from left wing, blocked by Conor Sammon (Wigan).